Biltong is a 400-year-old tradition of curing meats that originated in South Africa. Biltong and beef jerky are both dried meats but the main differences between the two are the ingredients, taste and production process. While beef jerky often has a dry and smoky taste, biltong offers a unique meat flavor with less than 100mg sodium, no sugar, nitrites, nor artificial ingredients added. 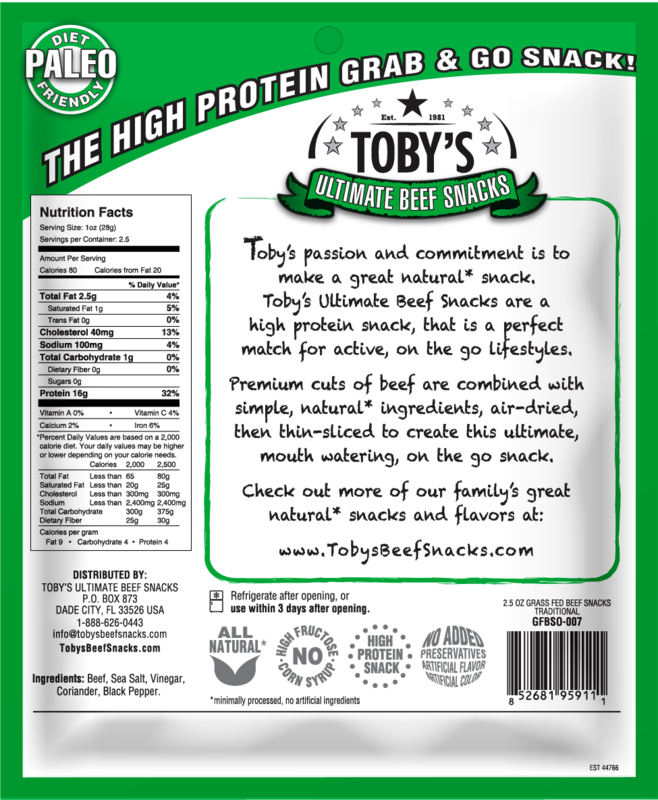 Toby’s Biltong/Jerky is made with the finest cuts of New Zealand Grass-fed top round beef marinated in a brine made with black pepper, sea salt, roasted coriander and a touch of vinegar, which is not specifically for taste, but used as a curing agent. Biltong is made with the absence of heat; the meat is dried for up to 20 days in a controlled cool air environment, giving Toby’s Biltong/Jerky a soft ‘medium-rear' texture and a delicious spice aroma. Despite not containing any preservatives, it doesn’t need refrigeration due to its curing process. Some of the finest crafted beef jerky made right here in USA! For those serious about good food and healthy eating! The perfect protein snack for sport enthusiasts, body builders, adventurers and outdoor lovers. Also a superb choice for those following the Paleo, Banting, Low Carb or High Protein eating plans.